Thanks for your comments on my recap of Oprah’s Vegan Challenge. Even though it is a deeply personal subject, I respect that we can share all kinds of viewpoints on the matter. Whether you liked the show or not, the show created a buzz and it has brought attention to an area that I think needs to be explored in more depth. I would love to see a follow up show explaining the vegan lifestyle and showing all of the wonderful recipes that you can make free of any processed fake products. That would be great! 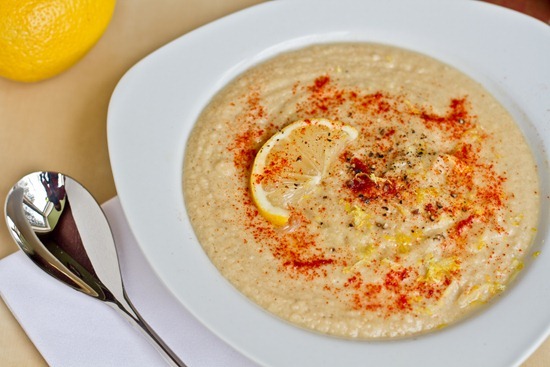 Hummus lovers, this soup is for us. When I saw this recipe for Garbanzo bean soup over at Kalyn’s Kitchen, I knew that I had to make it immediately. After wiping the drool from my face and reading over the ingredients, I concluded that it is basically hummus in soup form and I suspected it would bring my addiction to a whole new level. I thought, Yes, this is just what I need to stop spoon feeding myself homemade hummus straight from the food processor. I guess there is really no hope for me when it comes to hummus in any shape or form. Creamy, smooth, and comforting hummus in soup form. ‘Nough said. 1. In a large skillet, add in 1 tbsp of extra virgin olive oil. Add in the 1 cup of chopped onion and heat over medium for several minutes, stirring often. After a few minutes, add in the minced garlic and stir. Reduce heat to low if necessary to avoid burning. 2. 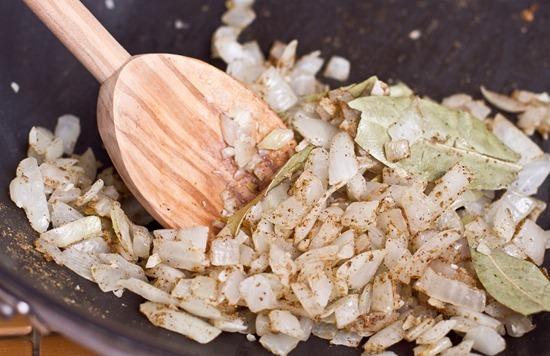 After about 6-8 minutes of cooking the onion and garlic, add in 1 tsp cumin, 1/2 tsp kosher salt, 2 bay leaves, black pepper, and 1 tbsp fresh lemon juice. Stir well and continue to cook over low-medium heat for another 4-5 minutes. 3. Now add in the 1 cup of vegetable broth (full sodium), 1 cup water, 1 tbsp tahini, and 2 cans of drained and rinsed chickpeas. Stir well and bring to a boil. Once it boils, reduce heat to simmer for another 5-7 minutes or so. 4. After simmering, remove from heat and let stand for a couple minutes to cool down slightly. REMOVE BAY LEAVES. 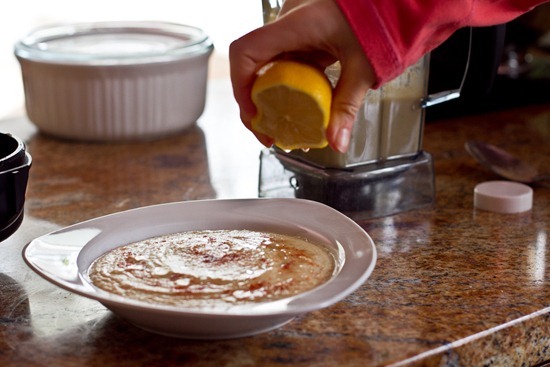 Carefully pour the soup mixture into a blender and blend until smooth. Be careful not to burn yourself if it splatters! 5. Pour into two bowls and garnish with lemon zest, additional lemon juice, olive oil, and paprika. Serve immediately. Makes 3.5 cups. The first time I I made this soup, I followed the original directions exactly, but I found the procedure very lengthy and time-consuming. For this second version, my goal was to simplify the recipe as much as possible. I am really happy with how it turned out. 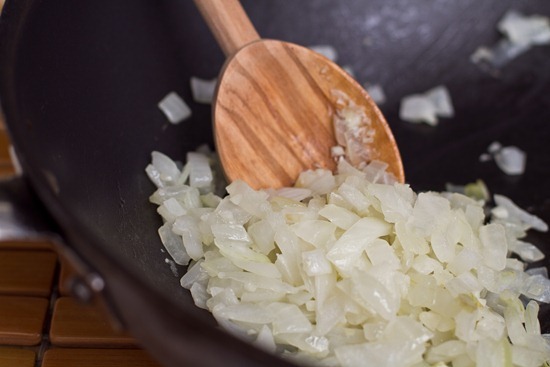 The first thing you do is sauté the onion and garlic for about 7-8 minutes. Add in the kosher salt, cumin, bay leaves, and 1 tbsp of lemon juice. Stir well and continue to cook for a few more minutes. Now add in the 2 cans of drained and rinsed chickpeas, 1 cup veggie broth, 1 cup water, and 1 tbsp of tahini. The tahini is probably optional by the way. I added it in because my favourite hummus has tahini in it. I’m sure it would still taste good if you don’t have any! I used full-sodium vegetable broth. If you use reduced-sodium, you will likely have to use more than a 1/2 tsp kosher salt, so always adjust to taste. If it tastes bland, you need more salt and seasonings. Bring to a boil and then simmer for several minutes. As I was cooking this, I thought, This soup is nothing special at this stage. It tastes OK and doesn’t really have any wow factor. Throw on some fun toppings. Garnish with paprika, lemon juice + zest + wedge, and a drizzle of oil. and the soup comes to LIFE! It all made sense to me when I took my first bite. 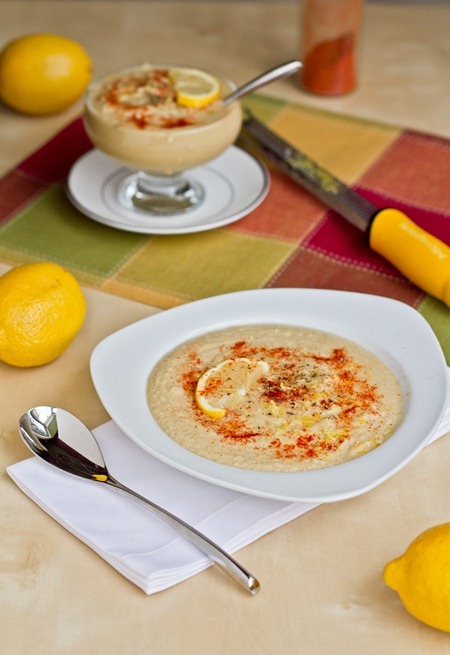 It is creamy, smooth, and if you enjoy hummus you will love this soup. It goes lovely with a big hunk of bread too, but I’m sure that goes without saying! It didn’t last a day in this house. I really have a problem. Oh and by the way, it is amazing warm and poured over a salad. It is almost like a vegan Caesar salad (if it had more garlic!). No. Freakin. Way. Girl, I eat hummus with a SPOON, I don’t know why I never thought of this!! You are a genius, I am making this tonight in celebration of our first snow day in 7 years (our superintendent is from Alaska, go figure). Ha, when I saw this I literally thought: it’s hummus in soup form!! This looks fantastic!!!! Hahaha. I was thinking that the soup was just pure hummus! It looks really good though. I would be tempted to dip pretzels, carrots, and sugar snap peas in it though. Ohhh – this sounds fabulous, and so easy! I do love hummus, but I’m not sure that I’m sold on it in soup form. I do think that if I made this, I’d leave half of it chunky and not blended, just to create some texture variation! I might have to give that a go! 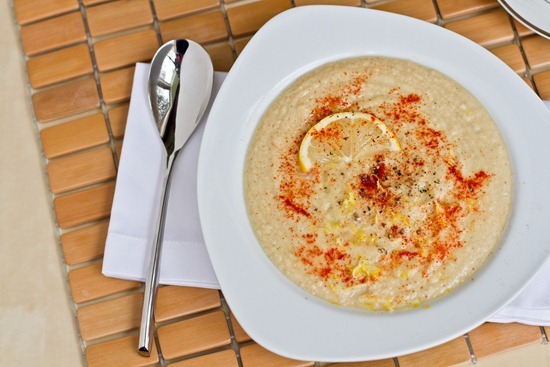 If you like hummus you’ll LOVE this soup. 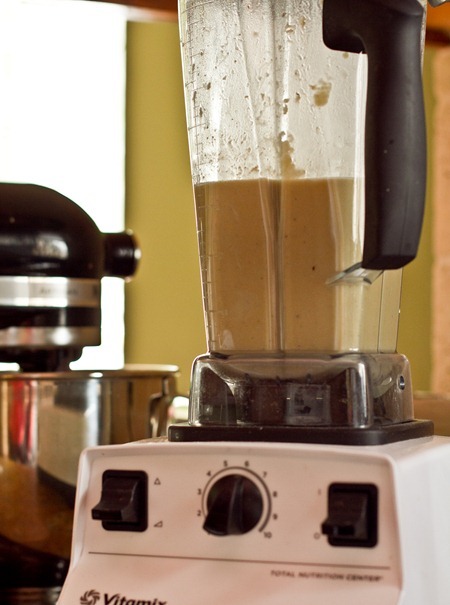 Using the blender is what makes it ‘hummus’! Double the batch and you’ll not Be sorry! If I was on death row, this would be my last meal. With a slice of buttered crusty bread. And a glass of wine. Followed by a giant piece of flourless chocolate cake + almond ice cream. Beautiful soup. I love that bowl! 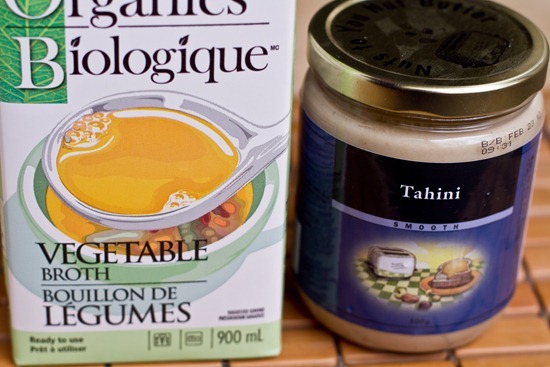 wow- just what the vegan world needs- hummus soup! yay! This is so simple, yet so amazingly creative! I love it! Wish I’d thought of it. 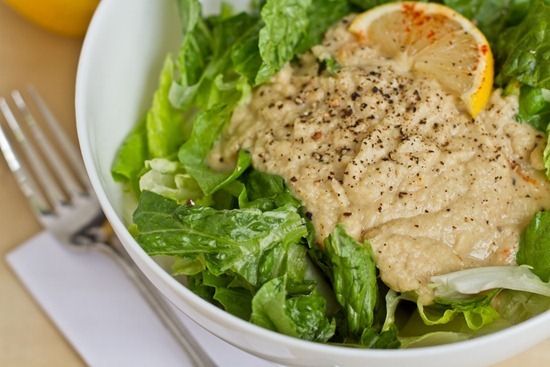 Now it’s perfectly acceptable to eat hummus by the spoonful! Wow, you’ve outdone yourself w/ this one! I’m going to have to make it tonight! Dreena Burton has a chickpea soup in one of her books that tastes just like warm, creamy hummus. I know I would love this dish just as much. 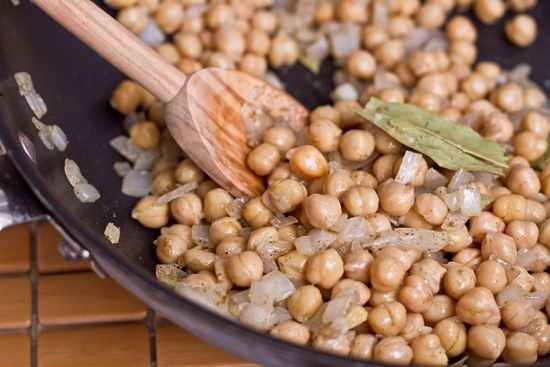 Chickpeas are a superfood!!! Hmmm, I had something in mind similar to this for lunch today! How does roasted red pepper garbanzo bean soup sound??? Like Hummus Soup! It even looks like Hummus! Do you find it difficult to find the ingredients you work with and eat if you live in a small town? Is it easy to get stuff? Wow, that soup looks amazing! I am so pumped because I actually have all of those ingredients just sittin’ around! I am completely snowed in right now and think that making this soup will be the perfect way to enjoy the day! I’m not sure I would like this in soup form, but as a warm salad dressing it looks delicious! Angela: I have made one of your recipes nearly every day this past week – last night was definitely a keeper (sweet potato & black bean salad). I’m definitely going to have to put this one on the list for next week! Thanks for everything!!! This does look like a giant bowl of hummus. I am all for a giant bowl of hummus!! Looks incredible!! I think I would really like this on the salad! The crunch and the warmth would be perfect together. Brilliant! This seems to be a delightful soup…very healthy and nutritious too ! Pretty sure my mom is going to pronounce me her favorite child after I make this for her :) She loves (!!) hummus and thick soups/stews, so this is perfect! Add to it all the intense weather we’re having and it’s the perfect recipe to keep her warm. Thanks, Angela! Oooooh, I kind of want to make that RIGHT NOW. but I do not have any garbanzo beans. Next week though! You should check out Oprah’s website if you hadn’t already :). 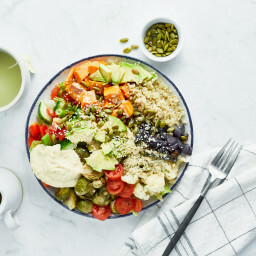 it’s filled with info and stories and recipes on the vegan week! thanks for sharing that by the way, I wrote about it for my readers as well now in tomorrow’s post. i, too, really appreciated reading all of the comments generated by your post about the oprah show, angela (good thing it’s a snow day here and i had the time!). it was so enjoyable to read all the differing viewpoints, and ideas…yet everyone expressed their thoughts respectfully. good luck with the shovelling – it’s really coming down here again, too (waterloo)! I second OSG on Oprah! I never seen the whole episode and have to go back to read the post/comments – but the clip I did see really, really surprised me – picking up fake soy products in the grocery aisle! Really surprised me. Too bad – I would have thought the Writer would have been a little more conscious of that. Wow I know what I’m having tomorrow! Looks and sounds absolutely delicious! I have every ingredient in my pantry already so I’m thinking I will be making this soup very soon! This sounds as good as it looks. I remember the first time I tried hummus. It involved me, my dorm and hummus. I didn’t leave for two days. Lucky for me I had both a bathroom and a refrigerator. Maybe I didn’t leave because I didn’t want to share, maybe I didn’t leave because I was in a hummus coma. I’ll never tell. I’m not ashamed. This soup will be made and devoured this week. Oh, I’m torn! I actually have chickpeas simmering in my slow cooker right now because I was planning to make Gena’s sweet potato hummus tonight, but now I don’t know! This soup looks so yummy and something warm would be welcome as it’s still pretty chilly here. No freaking way! This is amazing! Sign me up! What a great idea! I loved the look of the finished product garnished with a lemon slice and paprika. I could almost taste it just looking at it! This is my type of recipe in so many ways. Plus I have a Vita Mix now! I can’t wait to try this. Fresh lemon juice too, yes well done! Mmm… you had me at “hummus soup”! I only have one can of chickpeas right now (and am not venturing out in this weather! ), otherwise I would have made this today. Sounds so comforting. Mmmm…yes!!! 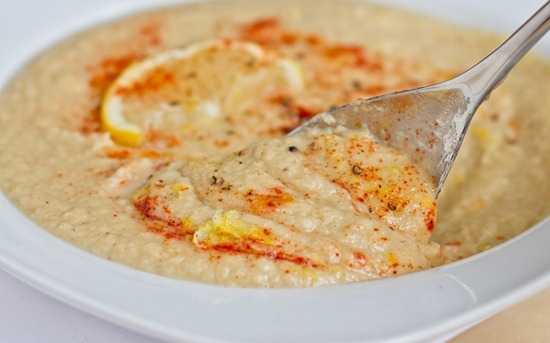 This looks just like hummus in soup form! Perfect! This looks incredible!!! I love garbanzo beans! This looks fabulous! And I just so happen to have a brand new jar of tahini downstairs. I do have one question: did you notice if the vita-mix was able to completely decimate the bay leaf, or should I take it out prior to blending to avoid any sharp edges? 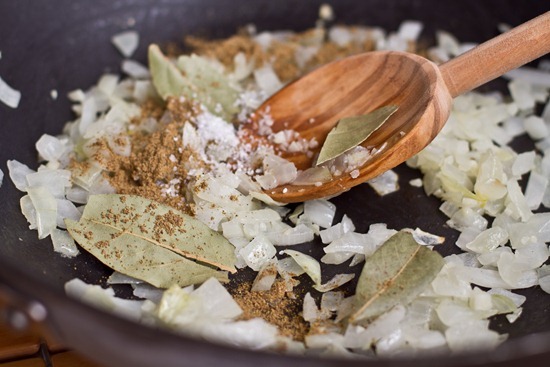 Or, for that matter, is the cooking time long enough that the bay leaf completely softens up? Thanks! Oh thanks for reminding me, I actually removed the bay leaves before blending. I added this into the directions! Oh YES!! 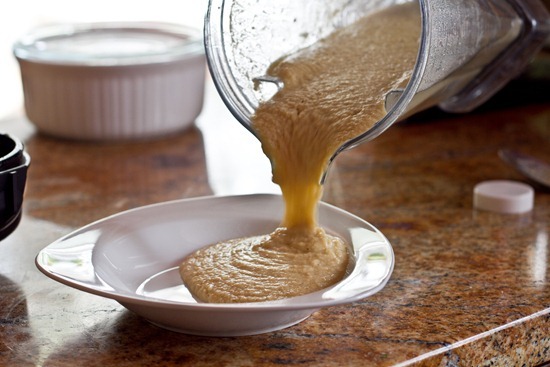 I love hummus– I’m making some today, for the first time! Next– I’ll be trying this:) Thanks for the recipe! That is so fun! Soup and shovelling!! It makes me feel so much better to read about everyone else’s hummus addiction. I’m pretty sure hummus is coursing through my veins by this point. Can’t wait to try this out! I am crazy about your website and all the wonderful things you bake and cook. I have been working to adopt a better lifestyle for myself and you have been a tremendous inspiration to me. I am new to so much of this and am so accustomed to a lifestyle of assuring that I have a protein and carb at each meal and at most snacks. I have learned that I feel more satisfied with the balance. Are most of your lunch and dinner entrees/recipes a pretty good balance of a protein and carb? In the animal meat world, the protein was pretty easy to figure out. Reading the side of packages makes finding a protein easy too, but being new to this world, I just wanted to ask. Thanks in advance for helping me out. You have opened my eyes to health! I try to get in a vegan protein source and complex carbs with every meal. This could be anything from lentils, to beans, to nuts/seeds, and whole grains. I don’t count protein grams, but I did do an assessment of my diet when I first made the switch just to make sure I was getting enough. Oh my god! Hummus in soup form!? I eat hummus everyday and can go through a triple batch in a day. I am a hummus fiend and I can not wait to try this! Oh my gosh. I have a serious addiction to hummus and this sounds absolutely amazing. The best soup I have seen in a long time. That’s just because it’s like hummus. I wanted to let you know that it is because of you that I finally got a light box! I’m still working out all of the details (the right lighting), but already I am able to take food photos again (this winter has really been a doozey!). Thank you for sharing the behind the scenes of your blog! It looks sooo creamy and delish! Yum! I am one of the only people who can’t hang with too much hummus. Sigh. The beans. Too many and my tummy isn’t happy but I need to try this, just b/c it looks so wonderful! I love hummus in soups too.. and hummus soup? Yum! I have a kind of similar soup on the stove right now.. tahini/soy puree is the base.. millet, sweet potatoes, collards and onions are in it too. This oup sounds great! I looooove hummus, so I’m thinking I’d dig this soup. I’m thinking adding roasted garlic would be divine!! Hope there’s not too too much shoveling ?! Oh and buy a gorgeous soup bowl like yours!!! We must have both had chick peas on the brain today. I roasted chick peas for lunch and they were delicious. I actually ate my lunch while reading this post. Yum! All I had to see was the title and I was like, “yes please!” You’re a genius. 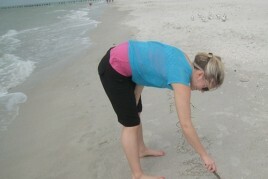 So you are shoveling soup & snow huh?! That soup sounds tasty; I might leave some of it not blended so I can scoop it up with pita! I love to eat my hummus warm! So this soup is right up my ally. By the way I have another hummus variation you may just love! 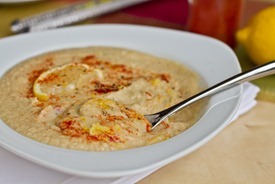 Check out my holiday hummus if you like, in my recipe index on my site. You may want to make the hot pink hummus for Valentines day! By the way I made the avacado pasta!!! OOOOOOOh my goodness I am in luhhhhhh huuv!! 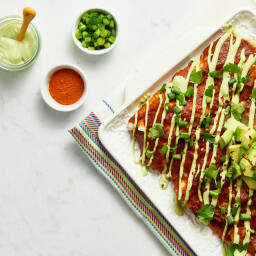 If I didn’t use my last can of garbanzo beans to make bean patties for lunch today I SO would’ve made this for dinner! 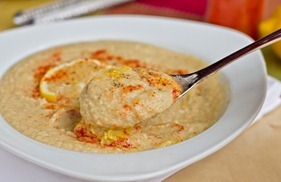 hummus soup, i love the idea! Also, I made some chewy balls based on your recipe, using peanut butter, barley malt, puffed millet, sesame seeds, hulled hemp, shredded unsweetened coconut, and chopped pure (no sugar) chocolate. SO GOOD! Thanks for the inspiration. PLUS, seeing as millet is so nutritious, I can down two of these and know my body will thank me! 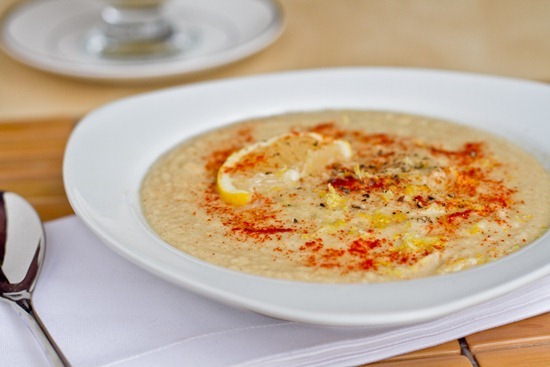 Hummus is my absolute favorite, I am sure I will love this soup. This sounds incredible! I’ll be moving to Israel in less than a week where chickpeas are an overflowing commodity at the Tel Aviv street markets. This will give me something new and unique to share with my new roommates! What an interesting concept. I never thought of garbanzo beans in a soup form. My first thought when I saw this soup was that it looked like a giant bowl of hummus. :D Love this idea! Yum! I can’t wait to satisfy my hummus addiction with this too. I am not the hugest hummus fan, but I do like garbanzo beans (does that even make sense?). I am going to make this soon! I think awareness should be made into the production and farming of ALL foods. Pesticides, poor slaughter practice, and preservatives in foods need to be explored and exposed to the public. I believe that people are intelligent enough to understand where they food comes from and how, but are autonomous enough to make decisions on their own dietary habits. That being said, I don’t think a “meat-free society” is realistic. It’s easy to stake that claim when you live in luxury and have finances to buy groceries. If you lived in a very rural setting or lived in poverty, you wouldn’t want restrictions put against you on what you can and cannot eat. I find this very personal because I come from an aboriginal heritage, where hunting and gathering is in my blood. If someone came up to me here and insisted we were wrong for hunting and fishing creatures that have sustained us for thousands of years, I would be deeply offended. Just as I am sure a vegan would be insulted if I stated they were “missing out” by not eating meat. I like that options are discussed and created. For example, I love the recipe you have posted and will definitely make it. I may eat it alone, I may eat it with fish. I appreciate the variety, but I don’t want to hear gospel on how one diet is better than another when the issue isn’t the food…it’s the quality of the food. Yum, hummussy goodness in a bowl. I have a recipe for hummus-type pasta sauce which is similar to this. Such a neat idea! I don’t think I like hummus enough to eat it completely by itself, but still. Doesn’t seem like you can go wrong with this one! yah, this looks amazing! i could eat hummus on any and everything! and with this crazy arctic weather here in texas, it will be perfect for dinner this week! I have been reading your post for almost a year now. I love your recipes and can’t wait see what you come up with. I have a challenge for you. I love the Chex-Mix Turtle flavor. The carmel and chocolatety pieces are awesome and I would be interested in seeing if you are able to veganize it for a truly guilt free treat. I will have to look up what this is! Hi! I am new to reading your blog but it has quickly become my favorite past time, especially when I’m in the midst of my eating disordered behaviors. You really help me ground myself and get back on track with recovery. So thank you for that, you have helped me in ways you will never know… On another note I wanted to say that I am slightly in love with hummus(understatement of the year) just like you so this recipe is feeding into my obsession hah! I was wondering if you had any healthy ideas that involved pretzles(organic ones), sliced bananas, and nut butters?? I was thinking maybe layering them and popping them in the microwave to warm them all up. It sounds delicious to me but I never have time to experiment with these things! As for an idea…what about mashing the banana and then swirling in the nut butter into the banana…then use that as a dip for the pretzels? hummus soup! how could that ever be wrong? I’m not a huge hummus fan (I know, I know, Sssssshhhhhhhh!!!!!) But I love garbanzo beans — strange, huh? This soup looks delicious and I have to say that your photographs are absolutely stunning!!! What a great idea to serve garbanzos in a soup! Squee! I bookmarked this on Kalyn’s Kitchen but, as you say, it looked quite complicated so I put it off. Thank heavens you cam to the rescue! As soon as the weather cools down here in Australia, I’m going to make this. wow!! this soup looks incredible!!!! thanks for sharing. I have a question…does it taste more like a soup or is it like eating hummus out of a container? I would say it is a mix between the two! Oooh my gosh, hummus soup. My heart is all aflutter! I have looked at this recipe about 10 times today. I would make it becuase like you I love hummus so much it is hard to stop eating it. could the soup be thinned a bit more without losing the taste? I am a little afraid to eat an entire can of beans at one sitting because of GI distress… any ideas? I made it tonight with 3 cups stock and one cup water, 1/2 tsp salt and one extra clove garlic. While not as seductively creamy as your’s, it is delicious and hits all the right hummusy notes. Thanks for sucha yummy recipe, the first one of your’s I have tried. I am sure to try more soon! OMG!!! Hummus in soup form??? Be still my heart. This will be made in our home very soon! Thanks so much for sharing!! This looks so freaking good! I finally have a warm hummus to eat with a spoon…..
And I was only just wondering how else to use up the copious amount of chickpeas I have cluttering my cupboard – hello dinner!! Looks like another winner. I’ll be the first to join….I’m ADDICTED! Yum! I’m addicted to hummus myself. This soup looks right up my alley! oh my gosh.. this is not even funny.. this is PERFECT for me! Wow talk about something easy and yummmmy! great job! No way! Hummus soup sounds incredible. Thanks for sharing! Hummus soup?! What is it my birthday, I am so going to make this! 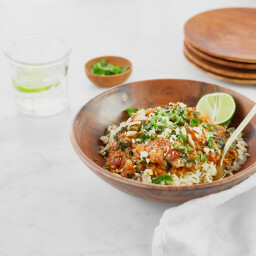 OMG, I am going to make this tonight for dinner! Thank for the recipe. OMG!! This sounds so amazing! I am definitely making it this weekend!! UM… btw – I love (and I mean love) your spoon! OMG. May I ask where you bought it? I’d kill for some of this soup right now! I’m freezin’! Being raw during a month of snow was a terrible idea for me! Lol! I made this and loved it! I added a cup of liquid to make 3 slightly lighter servings. Delicious. Great recipes BUT they’d be a lot more useful if they had nutritional information with them. I’m careful about what I eat and even though your recipes look good I seldom get around to making them because I’d have to calculate the values for a recipe I’m not certain would be within my guidelines……DARN! Amazing!!! This soup was so so good, I added tomatoes and it reminded me of the roasted tomato hummus I buy at the store. Hey Beatirz, so glad to hear that you enjoyed it! 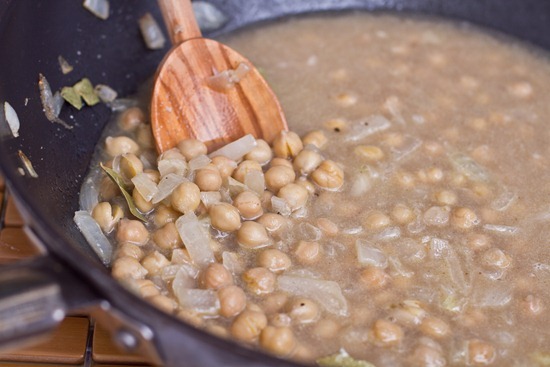 I’ve done this before – accidently opened a can of garbanzos when I meant to open black beans to make a bean soup so I gave it a shot Wow! And the leftovers thickened up when cold and worked really well smeared on a tortilla that I then wrapped around some veggies and a bit of chicken to make a wrap for lunch the next day. I should do this again. Soon! I made this last night and had it for lunch on top of a big salad and ooohhh my gosh! It was amazing! Thank you so much! This soup is AWESOME. I think I have a bit of an addiction to your recipes, I’ve been making them non-stop for the past few weeks, and I have yet to be disappointed! Just tried this for dinner last night! It was amazing! It was simple and easy to make but nice and creamy and is a nice healthy comfort food. Your recipes are awesome. It’s great to hear you enjoyed the soup, Toya! Thanks for the lovely comment. I am thinking… pumpkin hummus soup?